Artistic Wire "Buy the Dozen"
Home > **Tools** Books, Wire, Cord, Thread & Supplies > -Wire- Sterling Silver, Gold Filled, Copper, and Memory Wire > Artistic Wire "Buy the Dozen"
It's easy to bend, yet it holds its shape to make loops and rounded bends for creating beautiful jewelry, home d�cor items, paper crafts, gifts, or wire beads. 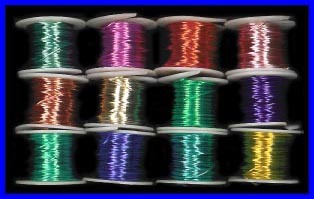 Artistic Wire is resistant to scratching, peeling and marring due to the special enameling process. After the enamel is applied, the wire is clear coated to prevent tarnishing. 12 pack of five yard spools (60 yards total); colors vary.